How do people learn? Chances are if you ask almost anyone, they will tell you they learn best by doing. This is a commonality across all ages, genders, cultures, ages and disciplines. The best way to learn to make a pie is to make a pie. One can certainly be told about making a pie, watch a video about making a pie or read about making a pie. With that exposure it is likely that one could then answer questions about how to make a pie, draw a picture of making a pie, or pass a written test on making a pie. Yet upon entering a kitchen would one really know how to make a pie? It is likely there would be no disagreement that the most effective way to learn to make a pie is in a kitchen with hands dusty from flour, slippery with lard and stained by the fruit for filling. Yet the world has become so complex and there is so much that one must master in a formal education process that hands-on learning has all but disappeared. Sadly, this trend is making its way into earlier and earlier experiences in the field of education. A mother reported years ago that upon entering her first grade classroom, her six-year-old child appeared confused. She turned to her mother and asked, “Where are the toys?” She could not Imagine being able to learn things without items she could hold, explore and manipulate, e.g. toys. Instead she was introduced to the world of ‘seatwork’. She was seated on a hard chair, at a desk or a table with other children with whom she was not to speak or interact. Two dimensional information was disseminated to her, generally either by either by spoken word, reading or a media presentation. She then may have been asked to demonstrate her ‘learning’ by answering questions about what she heard, perhaps making a poster or a diorama to demonstrate her ‘learning’. This was first grade. Perhaps the lesson was on starfish. Although there was no hands-on opportunity to explore the starfish, she was judged to have learned about starfish if she remembered information shared with her and could repeat it back to the teacher. Thus hearing and remembering became the measure of formal intelligence. The more one could remember and recall the smarter one was deemed to be in a formal education setting. 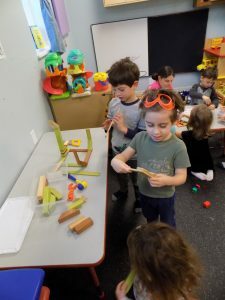 As this trend has continued downward, kindergartens now have tables and desks where children do ‘seatwork’ rather than learning centers where children explore materials that teach them about the world around them. Access to toys and play is limited to ‘noneducational’ time. Thus the adults around them are satisfied that the kindergarten children are ‘learning’. Taking it one step further, preschool programs may be judged to “have no curriculum” or not be “actually teaching” if observers do not see children sitting at tables doing ,’seatwork’. Nothing could be further from the truth. Skilled early learning programs and teachers create opportunities for children to encounter the world directly, utilizing all their senses. 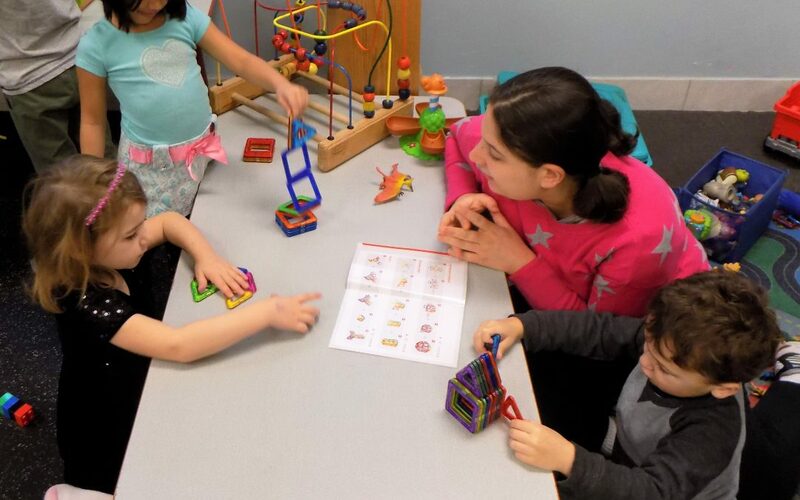 The direct experience is enhanced by interaction with the teaching staff and expanded to include academic concepts, letters and sounds associated with the experience, science & math concepts. In this manner children master the concept at an organic and complete level, rather than memorizing by rote. This constitutes true learning and creation of a foundation to build upon as more sophisticated concepts are introduced. An effective early learning curriculum incorporates all the child’s senses, provides for direct exploration and manipulation of materials and an opportunity to generalize the knowledge. At James’ Place we utilize a professionally developed curriculum with activities designed for children at various ages and stages of development. In includes all senses and covers all academic disciplines. The content is on a 3 year cycle so a child entering the program as an infant or toddler, will not be repeating the same material year after year. In September 2018, all the children transitioning from James’ Place preschool program to their respective kindergarten classes are reading, writing their names and doing simple arithmetic computations. Yet at no time during their tenure would an observer have seen them sitting quietly at tables with a pencil and paper, refraining from conversing with their peers and producing ‘seatwork’.